Through global efforts, stranding data gathered by scientists and volunteers alike has changed how we as environmentalists respond to stranded and entangled marine animals. 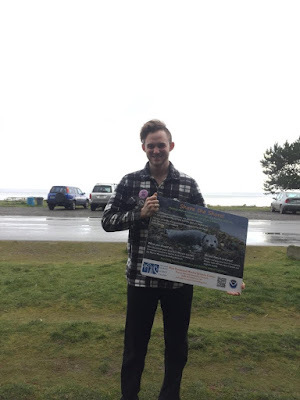 The stranding network of the Port Townsend Marine Science Center is responsible for managing stranding reports and other animal calls year-long. The work and science we do benefits marine life and the global environment, as well as the local community. We can examine stranded animals to determine not only what may have caused their deaths, but also to complete valuable research. Whales and dolphin research on most species is limited due to the elusive nature of the animals and the funding for field research. Training for working with these animals is essential. As a volunteer or scientist, one needs to know what they’re up against and how to educate the public. Betsy and I have been working hard to prepare a wonderful and thorough training to prepare volunteers to work with these animals properly. I have been working with marine mammals for three years, starting in a lab with where I articulated a bottlenose dolphin skeleton to put on display at Galveston Island State Park. During my senior year at Texas A&M at Galveston, I traveled to New Zealand working with Professor Bernd Würsig to take part in a dusky dolphin research team. While there, I worked with the Department of Conservation on the first response team to a stranded Cuvier’s beaked whale stranded half an hour from base camp. When we arrived, he had been dead 15 minutes. This whale is the deepest diving whale. In accordance with the Maori culture and their respect for these animals, you must ask Maori authority in order to collect more than basic samples due to the sacredness of the animal. Therefore, I only collected blubber and muscle tissue samples with a Maori-approved researcher. It is uplifting to see a culture with such appreciation of animals; a sentiment I brought back with me and hope to spread back in the U.S. Here at the Port Townsend Marine Science Center, our stranding network has an upcoming training Saturday, May the 27. The network is important for the Salish Sea because it helps the animals, researchers, and legislators. The EJC MMSN is looking forward to new volunteers at the upcoming training. Come by and receive a stranding kit that will allow you to respond to live and dead animal reports throughout the EJC area and learn about the mammals in the Salish Sea. If you have been a MMSN volunteer, please know that we need you to attend this training or speak with Mattie Stephens or Betsy Carlson to remain on our volunteer list. Marine Mammals play an integral role in the Salish Sea ecosystem, and volunteers are an important part of the stranding network! Become a trained responder through PTMSC and join in collecting important scientific data, working with live animals, and educating the public on our local marine mammals. Training attendance is required to join the network. Betsy and I hope to see you there!